I can't believe it's been over a month since I stopped by here! I've got no excuses, it's been busy, busy, busy. The holiday business is in full swing, we took a quick state-hopping trip to visit relatives, we cut two teeth, and we're crawling! (Okay, so it wasn't really me that cut the teeth, though when you consider the rough nights of upset sleep, it might as well have been). I've also got some exciting news jewelry-wise. I was published this month! 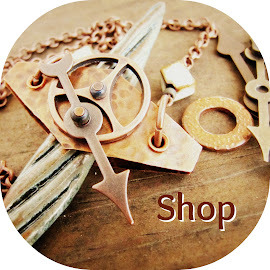 My Fidget Pendants were featured in Belle Armoire Jewelry and it was so exciting to see them there! The article includes instructions and illustrations on how to make your own Fidget Pendant if you're a metalworker. The best part about these pendants is the opportunity for creativity. 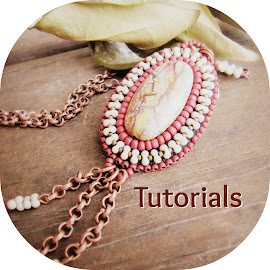 The design will work with any bead you have on hand. These particular funky polymer beads were an impulse buy from Tree Wings Studio. (A great buy if I do say so myself). 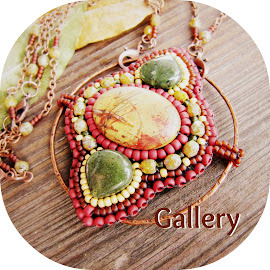 But, you could really use any bead that you have on hand that you've been hoarding away for a rainy day. This one is three beads deep for some real fidgety fun. Oh, and guess what, they're listed! I've put all three pendants in my Etsy shop! I've also been working on some submissions for 101 Bracelets, Necklaces, and Earrings. The color palettes that they have for this year are really cute and I'm hoping to get my submissions in the mail sometime between Christmas and New Year's. I hope you are looking forward to Christmas! My house is decorated and we even have a few gifts under the tree as of today! This is definitely my favorite time of the year and I'm trying to enjoy it as much as possible, it's definitely going to be a great one as it is Rosa's first.